The incredible Grace Bay Beach on Providenciales. Don’t let rain ruin your Caribbean vacation! Although many imagine the Caribbean as sunny year-round, many islands receive quite a bit of rain. Generally, smaller islands near the equator will receive less rain, whereas larger islands (and those further from the equator, receive vastly higher levels of rainfall. Amongst countries in the map above, the average number of rainy days is 149, with a wide variance. 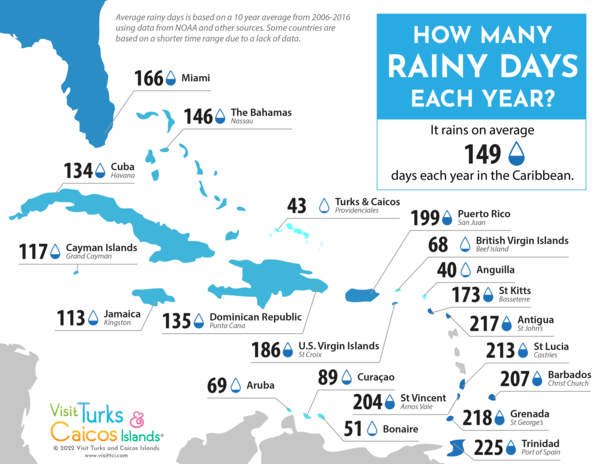 Anguilla, located north-east in the chain of Leeward Islands, sees the lowest number of rain days at 40, followed closely by Providenciales, Turks and Caicos at 43. A sunny day at Water Cay beach. Rain is caused by warm, moist air cooling and condensing. Mountainous regions can cause moist air to rise, form clouds, and produce rain. This is called orographic rain. Convective rain can be caused by the sun warming the ground, causing moisture in the soil to evaporate and rise. This can result in clouds forming and potentially precipitation. On small islands, there is the chance the winds will blow these clouds off the island, resulting in rainfall at sea. Does the Destruction of Rainforests Affect Rainfall? Whereas many factors contribute to the average amount of rainfall (and rainy days) a Caribbean island experiences, destruction of rainforests has been observed to result in reduced rainfall. 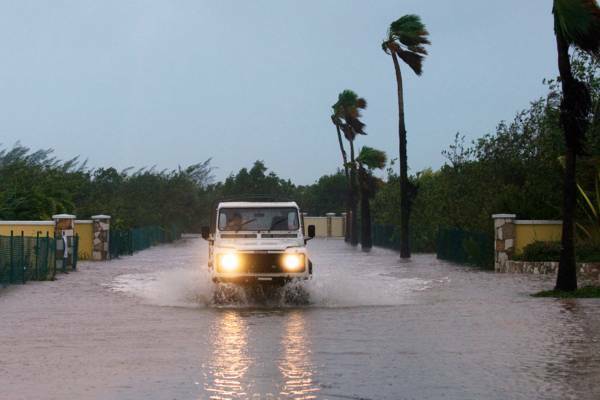 Flooding at on Providenciales, Turks and Caicos from the 2008 Hurricane Hanna. Hurricanes, tropical storms and tropical depressions, typically occurring during the summer and autumn months, are often the catalyst for much of the rainfall on some of the Caribbean and tropical Atlantic islands. It does vary by location, however many of the north-eastern countries receive much of their annual precipitation over the course of only a very few storms. In the case of the smaller islands, much of this heavy rainfall isn’t as beneficial to agriculture and vegetation as the apparent numbers suggest, as much of the water is lost due to oversaturation of the ground and water lenses. 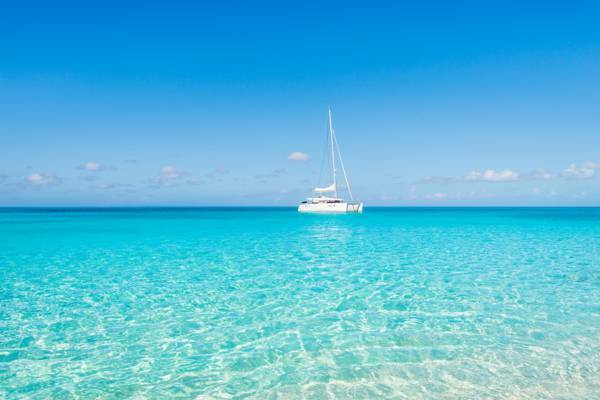 The Turks and Caicos and eastern Bahamian archipelagos are prime examples of this fact. Conditions throughout the majority of the year are so dry that only a unique tropical dry forest is common to the islands. Heavy rainfall brings about a vegetation growth spurt two or three times annually, with dormant conditions generally prevailing. In the Turks and Caicos, the extensive marine wetland flats on the larger Caicos Islands cause much of the predictable rainfall in the country. The sun heats the dark-hued ground in these regions, which in turn heat the surrounding humid air. The rising hot air then condenses into to rain. Due to the regular trade winds, the resulting rain tends to fall on and to the northwest of North Caicos, Parrot Cay, and Pine Cay. 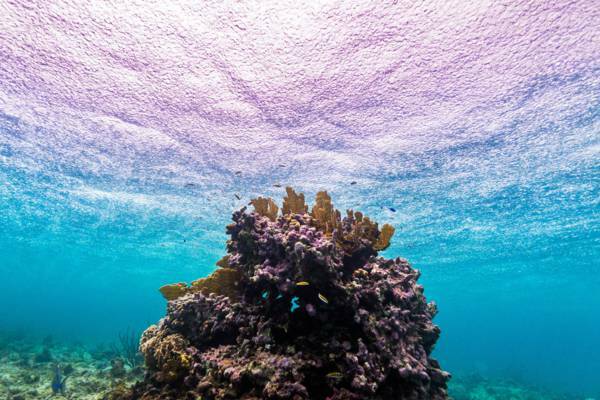 Snorkelling in the rain at Providenciales, Turks and Caicos.